1- Way FPS Drum Mount Transfer System | Lafferty Equipment Manufacturing, Inc. The 1- Way FPS Drum Mount Transfer System is a chemical transfer system that straps directly to a drum or tote of chemical concentrate or ready-to-use solution. Compressed air powers a FloJet air pump which draws chemical from the drum or tote and dispenses it into any other container through a 15 foot discharge hose and trigger gun. 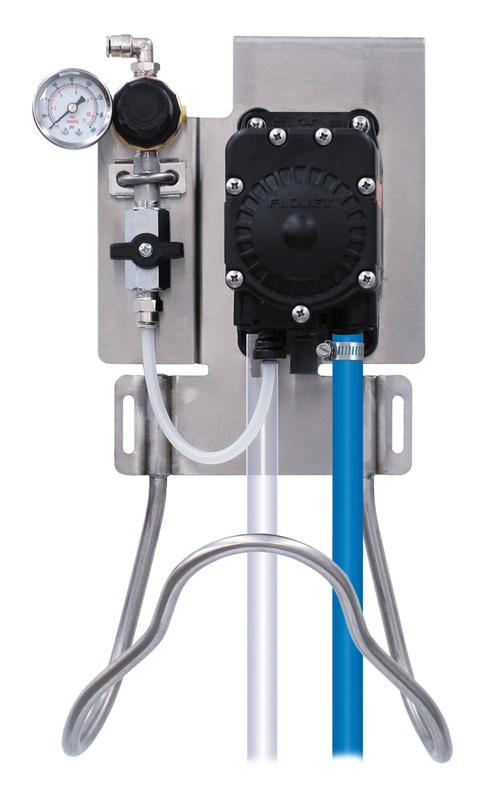 This unit uses a ball valve as the on/off control for the pump. Transfers chemical concentrate or ready-to-use solution from bulk containers into any sized container. Safely fills buckets, cleaning equipment, vats, tanks or anything without mess.